A small team of researchers from the U.K and France has found evidence indicating that Sicily's Mt. Etna is sliding very slowly downhill toward the sea. In their paper published in Bulletin of Volcanology, the group describes their 11-year study of the volcano and the evidence they found for its movement. Mt. 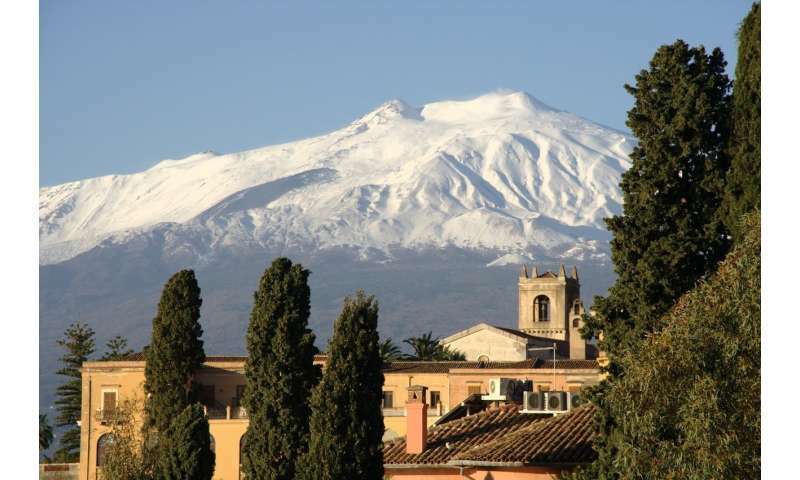 Etna is, of course, Europe's most active volcano. It is situated on the eastern part of the island of Sicily and has erupted approximately 200 times since 1500 BC—the date of the oldest recorded eruption. It was last seen erupting last year. The volcano has been the subject of study for lead investigator John Murry for nearly a half-century. As part of his research, he has worked with teams that contributed to installing very precise GPS devices at sites around and on the mountain. Data from those devices allowed the current team to note that the mountain has been moving. Over the past 11 years, they report, the mountain moved an average of 14 mm per year. It is moving because it is situated on a base of loose sediment on a slope of approximately one to three degrees. Furthermore, it is moving in an east-south-east direction towards the town of Giarre, though it will take some time to get there—the town is approximately 15 km distant from the mountain. Such movement by a volcano is known in the field as basement sliding. The team reports that their observations of Mt. Etna's sliding are the first ever for an entire active volcano. They report also that the movement they noted is not an imminent threat to people in the vicinity, but they do suggest it should be taken into account in the future. Prior research by other teams has shown that volcanos that move can suffer massive failure as the part of the mountain in front eventually gives way under pressure. More importantly, monitoring of the mountain for tell-tale signs of an imminent eruption need account for the movement of the mountain to offer reasonably accurate estimates of volcanic activity. Geological field evidence and laboratory modelling indicate that volcanoes constructed on slopes slide downhill. If this happens on an active volcano, then the movement will distort deformation data and thus potentially compromise interpretation. Our recent GPS measurements demonstrate that the entire edifice of Mt. Etna is sliding to the ESE, the overall direction of slope of its complex, rough sedimentary basement. We report methods of discriminating the sliding vector from other deformation processes and of measuring its velocity, which averaged 14 mm year−1 during four intervals between 2001 and 2012. Though sliding of one sector of a volcano due to flank instability is widespread and well-known, this is the first time basement sliding of an entire active volcano has been directly observed. This is important because the geological record shows that such sliding volcanoes are prone to devastating sector collapse on the downslope side, and whole volcano migration should be taken into account when assessing future collapse hazard. It is also important in eruption forecasting, as the sliding vector needs to be allowed for when interpreting deformation events that take place above the sliding basement within the superstructure of the active volcano, as might occur with dyke intrusion or inflation/deflation episodes. So how is the throat of the volcano and the magma reservoir affected by this movement of the deposited volcanic material? And is there no uplifted basement that makes the underlying slope deformed around where magma intruded upwards through the crust? Hoping for follow up articles in the future. This seems really odd/unique that the upslope portion of the volcano is apparently overriding the magma source like a continental plate sliding over a hotspot. Clearly Italy needs a really big retaining wall. The Mexicans will pay for it.